Kris and Organiser Bernard Thevenet have known each other a long time. I was a bit ropey on the first night; ‘what happens now?’ flashed through my head a few times. But we made it to the end of the night without any dramas; Franco is a little chesty but still has his sense of humour, so can’t be too bad. Martyn hold Franco up, all smiles. 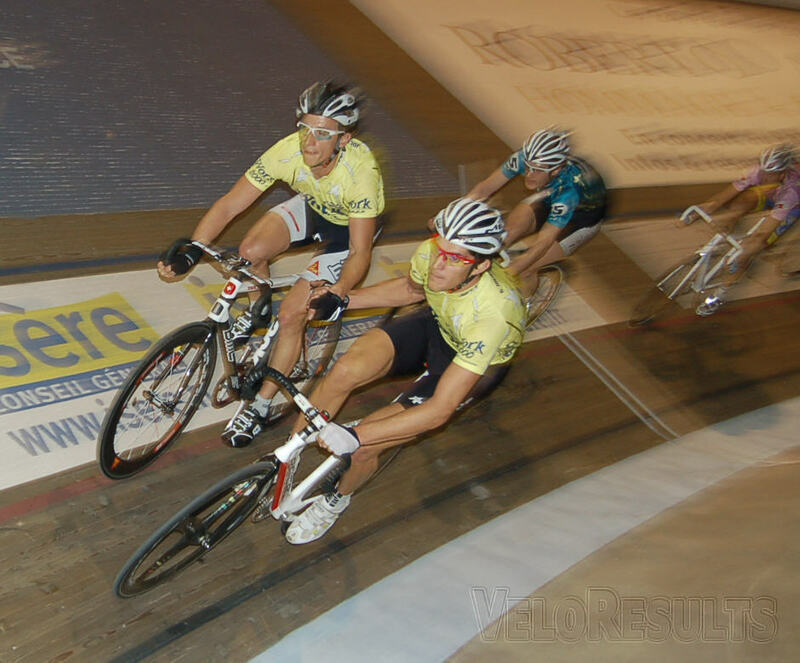 The velodrome is warm but there are currents of cold air blowing through the place; there’s also a lot of dust floating around from the concrete surface of the track centre not helpful if your chest is a bit tight. The track is a nice one, at 210 metres not too wee to be tricky or too big to make lap taking a big production. You want balloons? I got balloons. Alex Aeschbach spins the legs before the Six kicks off. The field isn’t amazing, but isn’t bad either, number one opposition is probably the Dutch pairing of Danny Stam and Leon Van Bon — although Dirk the mechanic did point out to me that their combined age is 80. On the subject of mechanics, Franco has decided that he doesn’t need the services of a spanner man — main reason being that there’s no Derny racing so no need for a specific bike or wheel changes. This has not made Franco flavour of the month with the mechanics that are here — they scowl at me when they see me carrying his bike or giving it a wipe. Aeschabach and Van Bon chat. 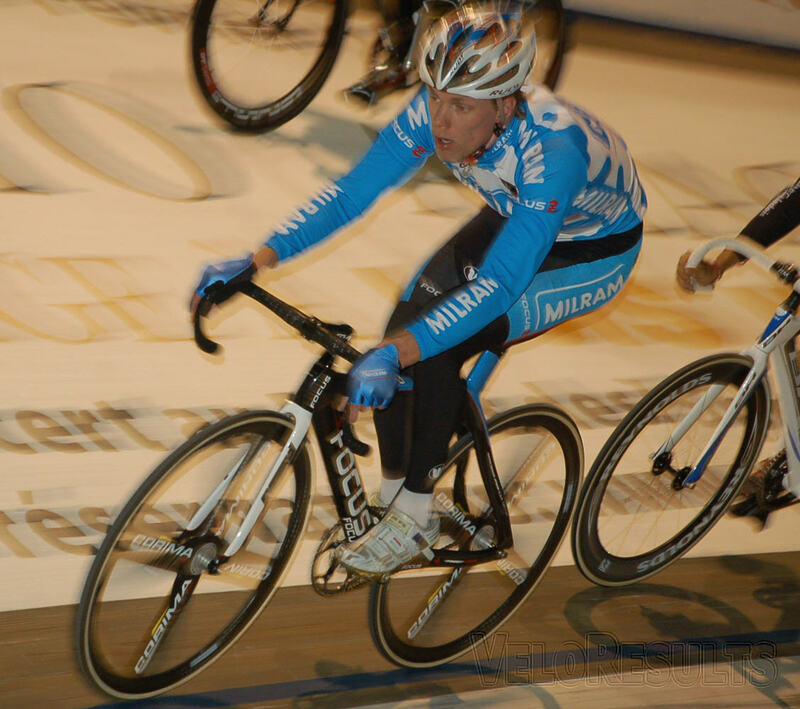 Getting back to the opposition, it looked like another Dutch pairing could be dangerous — Wim Stroetinga and Jeff Vermeulen; Stroetinga has been a medallist in the Worlds points and rode very strongly for Milram on the road in the early part of the season, whilst Vermeulen was third here, last year. Stroetinga loosening off last night, is a force here. But Vermeulen’s neutralisation with illness last night means it’s highly unlikely that they’ll offer any real opposition. 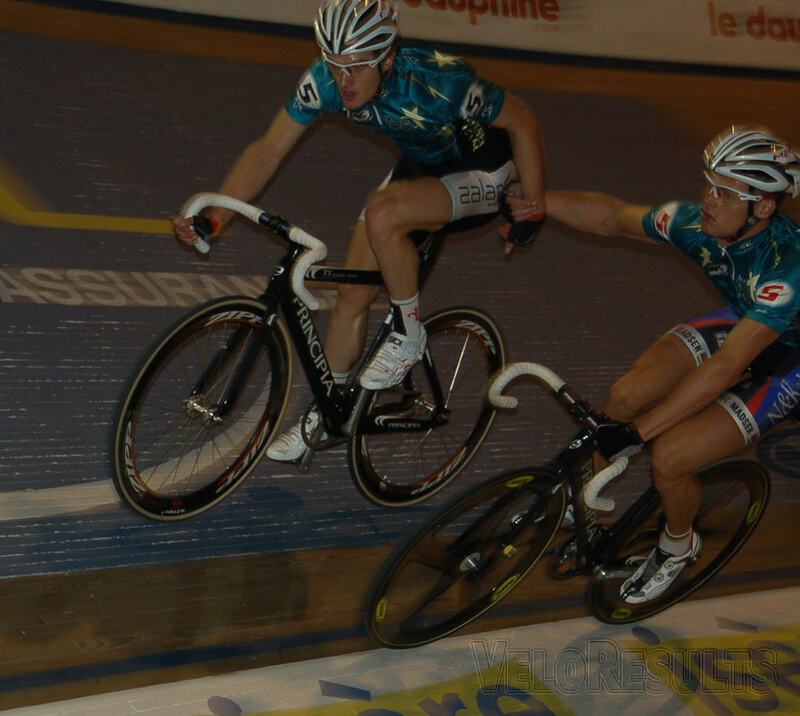 Another dangerous pairing has to be Belgians Tim Mertens and Kenny De Ketele — Mertens is a Worlds Madison medallist and De Ketele is an accomplished Six Day man from the Belgian ‘new wave’ of winter track men. 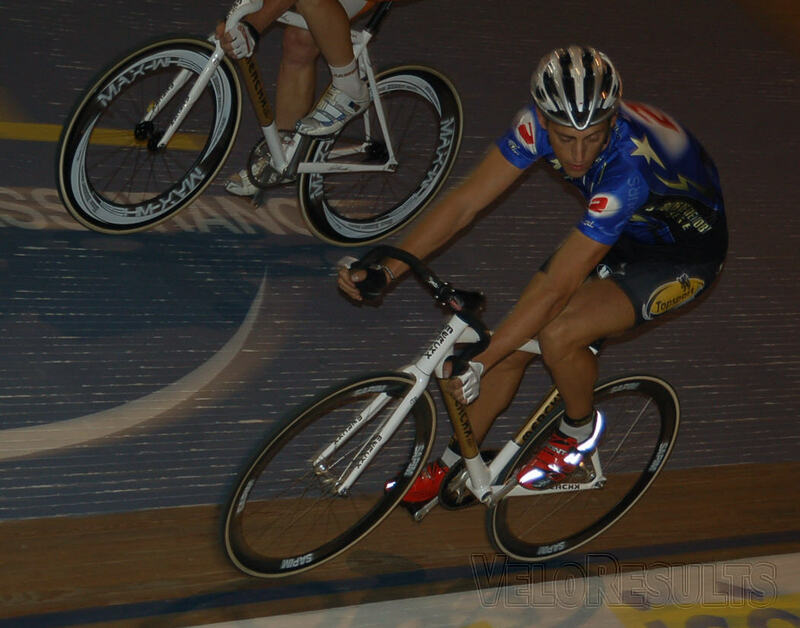 Tim Mertens won the first race tonight, the Points. The Czech pair of Kadlec and Hochman looked strong last night, but they can’t win – that would never do. An interesting name on the start list is Italian Elia Viviani, another in the seemingly endless stream of quality young riders that Liquigas produce — at just 20 as a neo-pro he’s won the Memorials Pantani and Vandenbroucke, this year. 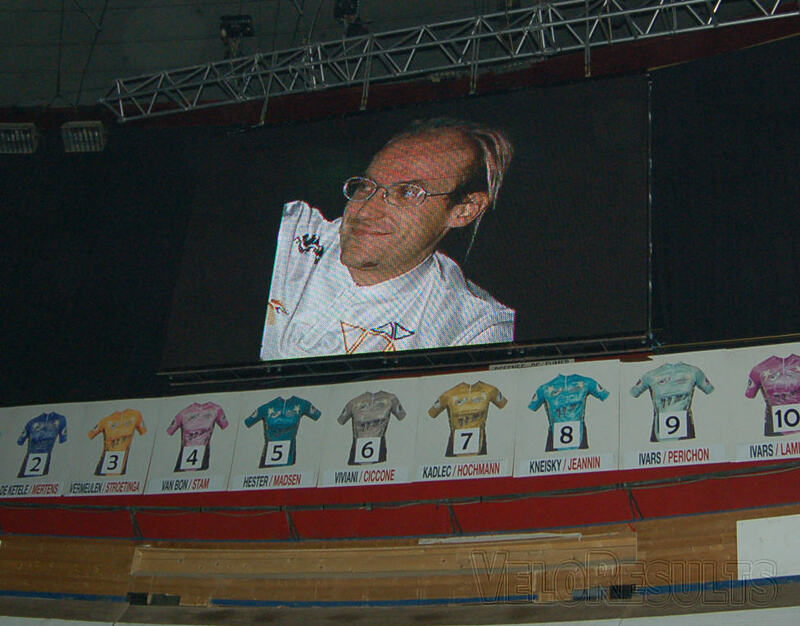 The Six kicked off last night with a tribute to Laurent Fignon, personally I think it would have been more respectful if the Folies girls and those bums of theirs hadn’t been milling around at the same time — but I guess, as a red blooded Frenchman with a thirst for life, Laurent may well have approved. Fignon wouldn’t have minded Les Folies hanging around. The cabaret acts are all a bit similar, this year, strong, shaved chested guys demonstrating how strong and well balanced they are — our mate Viktor would hate it. There were two bands on the go, the ‘house’ band perched above the finish straight and a rather deranged looking crew who roamed around the track at the start then lodged themselves up in the rafters — you can see the look of disdain on the house band’s faces, even at long range. The sprinters field is very strong, Bauge, Sireau, Perkins, Mulder — four of the best in the world. Mulder in particular is a brick built out house of a man. You wouldn’t say that Greg lacked confidence. 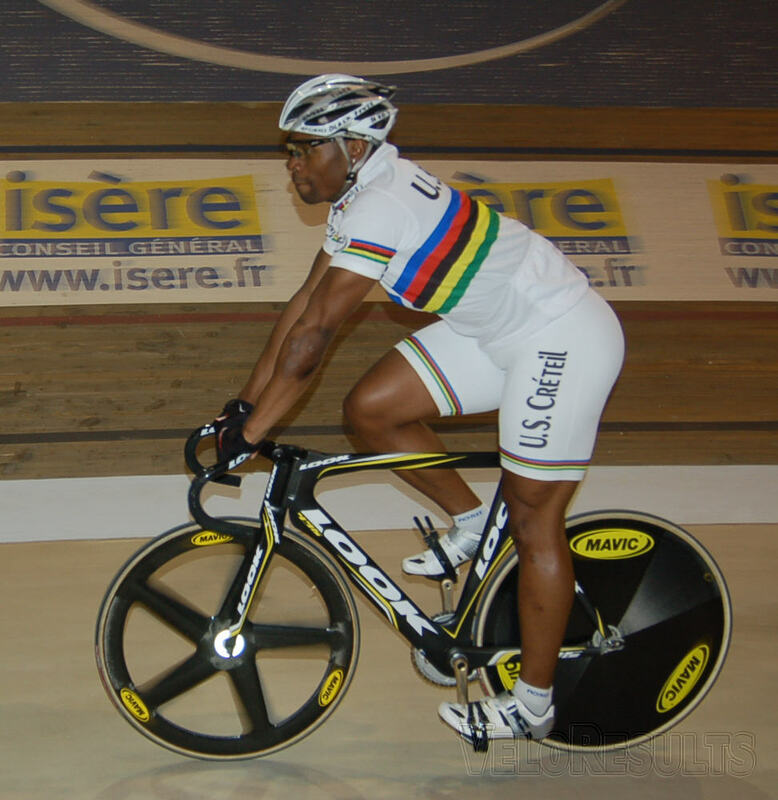 Bauge has the swagger that a rainbow jersey brings to a man – albeit he died badly in the 500 metre time trial to go down to Mulder. The track centre was stowed out — 95 tables of ten, all fully booked, as long as that happens then this Six is safe. t’s a mixture of the racing, and the show, that brings the crowds in. All in all the first night went in without too much drama; well, that’s 19:34, best get down there and get organised for tonight — did I say that the music was grim? So perhaps you’ll be seeing more of Les Folies here on VeloVeritas.